Mr. Robiati has spent his lifetime combining his business activities with a parallel educational and spiritual role which aims to bring the concepts of a new world order into business. A combination of publications and lectures delivered in a number of countries around the world has allowed him to deliver his growing experience and expertise to an ever wider circle of business people, civil society, professors & academics, students, baha’i meetings. 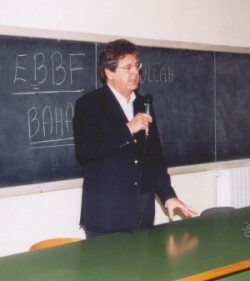 Applying his principles of ethics , of the management of human resources as the mine of gems that they are, of a business model that looks at the benefit of the stakeholders and the spiritual principles of Baha’u’llah , has allowed his entrepreneurial career to prosper whilst setting a practical example of actions meeting words. Working with a team of collaborators he has built an extensive curricula spanning a wide range of business issues as listed in the attached CV, his pillar remaining the entire concept and definition of ethical behaviours both as a vision in a new world order and as practical instrument in the business and socio-political scenario. He became baha’i at the age of 16 years from a catholic background. He entered the National Spiritual Assembly of Italy in 1973 and he is still there. – Born 14/07/47 in Asmara – Ethiopia.